Competency Based Education (or Proficiency Based Learning or Outcome Based Education) is the new rage, or perhaps the long-simmering pot that is currently coming to boil. Reformsters have shifted emphasis to it, and opponents have become increasingly vocal about it. Casual observers can be forgiven for getting the impression that reform opponents are just reflexively objecting to whatever reformsters like. If Bill Gates ate a cheese sandwich, would some of us be leading a "Keep cheese out of our schools" movement? After all, is CBE really all that radical or different? Don't we kinda do this stuff already? It's a fair question. As I've outlined before, Outcome Based Education popped up decades ago and immediately fell on some hard times, went into hiding, got some plastic surgery, and is now slinking onto the stage with a new name. But even though OBE was chased off the education stage, certain aspects of it have stuck with us. The much-beloved TSWBAT (that's "the student will be able to..." for those of you outside of education or under thirty) looms like a ghost over most lesson planning and reflects a fundamental shift of education in the late twentieth century, a shift to the notion that an Educated Person is one who can perform every one of the tricks on this master list. So we plan a unit with an eye toward the assessment at the end, and we do quizzes and informal checks and practice and we watch to see how well students are mastering the particular skill, and when we think most of them have it down, we give a summative assessment, and if most of the students show that they perform the trick on cue, we say, "Okay, most of these guys have it. We can move on." Starting with that foundation, we also recognize the foolishness of time-based education, that saying that Chris has been exposed to math for one Carnegie unit so that should do it, as if math is a radioactive element or contagious disease and once Chris has been exposed to math for a set time, we can expect that Chris will be properly infected with it. One of the universal issues with the pacing guides and scripted courses that have spread like kudzu during the Common Core era is that they make instructional assumptions based on time-- "All right, you've covered mixed fractions for one twenty minute lesson, so it's time to move on whether your students get it or not." In other words, mostly all of us mostly agree with some central tenets of OBE-- you should teach students, track their progress, and move on when they've shown they have mastered the material. So what's the big deal again? We know what it would take to create a perfect education system. We would need resource-rich classes to bring students together for learning, building, and growing socially and interactively, coupled with fully-individualized education with each student working with her own individual teacher (or team of teachers) armed with every conceivable useful educational tool and resource. It would be awesome. It would also be awesomely expensive and require a massive number of trained educators. We could never afford it. It would be on par with going to war, and hey-- you don't see us spending trillions of dollars we don't have just to go to war, right? Right? Anyway, we know what it would take to create an awesome educational system, and as country we lack the money and/or will to do it. So our entire educational system is a kluge of compromises, just as a teaching career is a process of trying to cover 100 square feet of ground with 50 square feet of cloth. We don't necessarily strap together groups of 20-30 students to travel through school together because we think it's the best way to do it, but because we don't want to spend the money it would cost for smaller groups and more individualized instruction (Well, we as a society don't want to-- those of us who can afford it go ahead and provide it for our kids). So we need to understand right up front that what CBE salespersons are selling is not the full-on, full-cost, top-of-the-line, competency based education model. They will show us the bigger fancy models, but what they're really selling is a way to get the full-CBE experience at a low, low price. They are the guys on the sidewalk selling twenty-dollar knockoffs that are Almost Just Like Prada. So whenever you're looking at an actual CBE system, ask-- What corners were cut? What compromises were made? Is that it? Am I opposed to CBE just because of possible compromise and corner-cutting? There are some issues baked into CBE that mean I am never going to be a fan. The premise of CBE is that all learning can be reduced to a collection of performance tasks. This is fine for simple, concrete skills. Identify grammatical sentence parts? Change a tire? Find the measurement for one side of an isosceles triangle? Bake a cake? Sure-- if you can perform each of the separate tasks involved, you can be said to have mastered the larger learning. But more complex skills don't succumb to merit badge breakdown so easily. You may pass the dribbling test, the passing test, the shooting test, the jumping test, and the blocking test, but does that mean you have achieved mastery of basketball? And does mastery mean that you can play on a YMCA pick-up team, or that you're ready to go head to head with LeBron James? And were the basketball competencies, both the content and the minimum level required to pass them-- did those come from somebody who is knowledgeable about basketball, or from someone who is knowledgeable about designing CBE systems? And that's talking skills. When we talk knowledge, CBE goes right out the window. How do we reduce an understanding of the critical realist movement in American literature to a series of competencies? We can't-- so we have to bake in two huge mistakes. First, we reduce it to performance tasks-- behaviors-- that somebody somewhere believes are the signs of understanding. The competency is literally not "understand the material" but "act as if you understand the material." Assessing this kind of learning is already a huge challenge for a regular classroom teacher, but CBE adds the element of saying that we will use exactly the same measure for every single student. Second, using CBE for knowledge learning means that the competencies will always be measured in terms of things we already know. If you are earning your competency badge for "understanding the causes of the Great European War," what you really have to understand is what the people who wrote the competency measure believe were the causes. In other words, CBE demands inside the box thinking-- even for fields in which the box is under considerable debate. For this reason alone, even under the best of conditions, CBE is extremely limited in what it can actually, really do. And unchecked, CBE wants to reduce everything to a list of competencies-- even all the things that cannot really be reduced to a simple list of competencies. "This man has collapsed and he's not breathing! Can you perform CPR??" "Well, yes. I mean, I passed my CPR competency test in 1997, so I'm sure I can." Step away from the man on the sidewalk. In keeping with the concept of fluid definitions of mastery, we get the idea that some skills need to be honed and repeated over time. CBE likes the one and done approach. Everybody passed the mixed fraction multiplication competency, so we never need to talk about it again. We've now all taken the write a paragraph competency assessment, so now I can count on everybody writing perfect paragraphs forever, right? No. There's a reason that my writing unit runs for thirty-six weeks. OBE was big on "all can learn all" and CBE wants to do the same-- assert that every child can learn everything. This is a way to navigate the above problem of defining mastery-- the "mastery" level of a competency has to be set somewhere between "any dope can do this" and "super-duper challenge." Each has its problems, most obvious being the number of bored or frustrated students. So we draw the line in the middle somewhere, and proceed to reject the bell curve. Every child can learn calculus. Every child can learn to play piano. Every child can read War and Peace. This would just be garden-variety dumb, except that it sets the stage for the defective child fallacy. The defective child fallacy says, "Well, my program is solid, and my teaching is solid, and this child hasn't performed. Every factor that I can control is perfection-- therefor, the only logical conclusion is that this child is defective." Problematic for older students, CBE also doesn't leave space for the child who says, "I could probably do this, but I don't want to. Today, I do not feel like jumping through my competency hoops to satisfy you." While CBE promises personalization in education, it actually leans toward taking away student agency, as the student is required to navigate an obstacle course over which she has no real control-- except to decide not to move forward when she has had enough. It is absolutely true that a CBE system can avoid this problem by allowing students a voice in designing their own competencies and assessment tasks. However, let me direct you back up to the portion about expense and compromise. Allowing this kind of flexibility is time-consuming and therefor expensive as hell. Additionally, it provides measures and results that are not easily compared and ranked, which in today's reformy climate is way against the current. The natural pressure on a CBE system is to create a miniature golf course of education, and while you may let students pick their own clubs and move through the course at whatever speed they like, they're all on the same course, shooting past the same windmills and dancing gorillas. As long as we are in an era that demands that everybody's score from the golf course be comparable and rankable, actual personalization will not be a top priority. These are the major issues I have with Competency Based Education no matter where and how it appears. But where and how it is appearing these days is even worse. Much, much worse. The big question about CBE/OBE is why is it coming back now, after being beaten down so badly twenty years ago. The answer appears to be technology. Nobody has spent more time digging up and laying out the who's and why's and wherefore's of this than Emily Talmage, whose blog Save Maine Schools has reach and importance far beyond Maine itself. But since I'm trying for an overview here, let me just hit the highlights. CBE now comes with a huge focus on "new tools" and new applications for learning management systems. What this boils down to is massive software programs to manage all student learning. 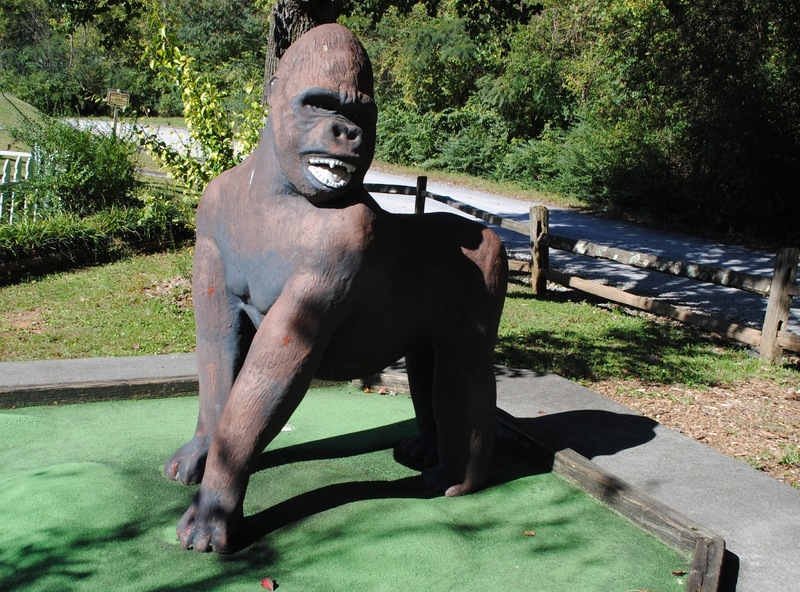 If we go back to the mini-golf course, we can now design a course of 2,000 holes and manage an individual path through the course for each child. It's big and complicated, but it is still one size fits all, and it still calls for the teacher to be just a meat widget coach, while all the instruction has been created by the company, pre-fabricated by a company that has never met the students. This is where the CBE advocates managed to ju-jitsu the anti-Big Standardized Test crowd, "Why, yes," they said. "It is foolish to try to evaluate student progress and inform instruction based on a single high stakes test. We really should stop giving one Big Standardized Test every year." And then, while everyone was cheering along. "What we really need is a small standardized test every day!" And voila! School shifts from being all about preparing students for the BS Tests, and becomes all about checking off the next competency badge on your list. You can go back almost exactly two years to read about Knewton, an outfit that is confident that if they know everything, they can control everything. Watch the 2012 clip in which this Pearson-related honcho explains that they should be able to tell you what you should eat for breakfast to do well on the math test-- and he's not kidding. The Data Overlords see in CBE a golden opportunity to get every single thing a child does in school swept straight into a database. When your child steps out of school, the Data Overlords will already have picked the best job for her, and any government or corporate entity that has access to her giant data file will already know alllllllll about her. Remember when your elementary school teacher would warn you that your misbehavior would end up on your permanent record? She had no idea. Now everything you do, every assignment you complete, every disciplinary action, every medical event, every family problem, every event in your life will be part of a record interpreted by people who don't know you and accessible to anyone with the money or power to gain that access. I'm frankly puzzled by this, because this is exactly what got Outcome Based education in trouble back in the nineties. But advocates of modern tech-driven have decided that they will also try to teach and measure and record data about non-academic qualities. Here's just one recent example that plans to cover curiosity, initiative, persistence/grit, adaptability, leadership, and social/cultural awareness. The new CBE school is not just going to try to teach these things, but test for them and record the results in the big pile of data. Which means that the program manufacturers are going to define what these qualities are and define the only program-recognized ways to display those traits. Someone is going to have to create performance tasks that will measure how curious your child is. There will be tests for leadership. And someone will write performance tasks to show if your six year old is sufficiently culturally aware. The new CBE doesn't just want to record a complete a detailed measure of the child's intelligence-- it wants to measure and record the child's character. The Big Data File will not just decide if the child is a smart person-- the programmers will also decide if the child is a good person. Some advocates of CBE will argue that CBE doesn't have to be about all this creepy Big Brothery datamining tech-dependent cradle-to-grave (you don't really think this is going to stop once you're out of school, do you) monstrosity, and those advocates are correct. It doesn't have to be this way. A teacher with a couple of aids and a small class size and lots of resources could implement CBE, and even do it in a way that minimized the problems that are baked into the CBE model. It's like the folks who said, "Look, Common Core is just a set of standards, and classroom teachers are still totally free to teach the curriculum they think is best." In some alternate idealized universe that was kind of true, but those folks belong in the same dustbin of history as scientists developing nuclear power and saying, "So you guys are going to split the atom only for good purposes, right?" CBE has some inherent problems, and those are reason enough to give pause before leaping into the CBE pool. But on top of those, we now have the problems of Data Overlords using the CBE model to launch a computer-driven assault on privacy and freedom. And that, boys and girls, is what's so bad about competency based education. Bravo, Mr. Greene, for a comprehensive look at a growing menace to children and their future. Few people understand the connections nor are they aware that the recently crafted and passed ESSA legislation has a link to assess and document "...if a child is a good person," by scoring children on their behaviors and their beliefs. Public input for this was sought late December 2015 and the deadline was January 4, 2016. With the holidays and distractions, how many folks were following educational issues, let alone this call for input? So the programmers who seek to fill that Big Data File which will follow an individual for a lifetime, have been able to forward their agenda unopposed so far. For the good of our children and their future, this deliberate and growing practice of data collection has got to be challenged and stopped. The potential for abuse outweighs any possible good it might have. Thank you, Mr. Greene, for providing the past, present, and projected future about CBE. The only way to change its trajectory is to talk about it and create awareness. Your article put into words what I've been struggling with for years as a Literacy teacher teaching comprehension to 4th and 5th graders. IE: Pass the basketball skills test then play with LeBron? You've given me ideas for teaching more about comprehension--thanks. Bravo Peter for bringing this into light. We must fight this even harder than we fought high-impact tests. My grandchildren will not be data-mined and continually assessed from cradle to grave. Nope. Never. If teachers don't insist that they be given the support and systemic collaboration to do it right, it will happen in all of the wrong ways that you've imagined above plus some. The ability to assess and record specific things about learning in much greater detail than was ever possible previously exists, now. We get to choose how we want that to be done, not if it will be done. Other than recording things in a data base, I don't see anything about this that's any different from traditional teaching. So your basic attitude is that CBE is going to happen, so teachers should leap in and make it their own before they are stuck with the corporate model. That ignores the fact that CBE is NOT effective education. I've developed lessons using LMS that were effective for some parts of what I teach. They always needed classroom interaction to be complete unless they were simply about data acquisition. Tell me more, Peter, about the things you teach that can't be reported and don't correlate with a set of standards someplace. Less seriously: Perhaps, following Rheeformers we should all refer to it as Pearsonalized Learning. More seriously, I do not think that there is the talent in the ed-tech world to design educationally sound programs nor implement them in software. You have put my thoughts on this into words. What a thoroughly hilarious, witty post! Thank you.
" I do not think that there is the talent in the ed-tech world to design educationally sound programs nor implement them in software. " Wow. Super dismissive. Is this what you would teach students. That they cannot achieve if they don't agree with you. That they shouldn't try to get to the moon. I think the people who design and make electronics, if they care to redirect that genius to education would crush your average teacher. It's just not even in the same realm of complexity. When you make a word document for your class or an excel document. Do you malign the software developers as not understanding education? Why you cannot conceive that software developers could make miraculous tools for education is beyond me. And it flies in the face of logic and common sense. You are writing your post on a computer which performs indistinguishable from magic to the laymen. Maybe but the very people that you claim are too stupid or ignorant to participate in the education market. Instead of the negativity. Dream big. Identify the shortcomings and come up with ideas to make it work. Spot on. We use SBE, and to teach my rich material I'm designing lessons and rubrics that I twist into about 15 different skills categories. Per assignment. And they wonder why I spend so much time grading! Big data crap. Thank you for an excellent article. To the proponents of CBE, I would suggest that instead of personalized learning, we need personal learning. That's not saying we need a greater teacher to student ratio, but we need to allow children to turn into self-learning adults. One major purpose of education should be to create life-long learners. I haven't been in school for 25 years yet I continue to study and learn things because I enjoy it. Students need the same ability (and passion) of being interested in a subject without being told what to learn, when to learn it, and what's on a test. As students age through the system they need to be given more freedom of time to pursue their own interests. This can be a class period or more. Self-study should be required. Let them choose their own subject and present to the teacher a plan for their own mastery of the content at the level they want to master it. When they've done that let them present a plan for the next topic they want to dive into, whether it's shallow or deep. When students pursue what they are curious about, they will learn it faster and better and the teacher can be there to guide the student in their own true journey. Completion of a unit would be writing a paper or doing a presentation for the class reflecting their mastery of that topic. That's lifelong learning! Students could even review each others' plans and challenge each other to perform. Teachers in this role could help students to obtain their own personal mastery, not some checklist of predefined mastery units or state standards. It is a grave disservice we do to students to tell them they have graduated when all they have done is learned to master what they have been told to do. If learning is truly self-learning, we need to reintroduce true self-learning to the school system. I believe the best solution is for as many parents who can to homeschool their children. It's highly and infinitely personalized, done by someone who has the kids best interest at heart, there's no creepy data stuff, and it can be incredibly cheap of you use the sources on the Internet and read older books. All it requires is a parent who is willing to learn and explore and learn alongside their kids. Of course, not everyone can or will, but I think those who do will reap the benefits of taking complete charge of their children's education.